Outside of camp, the children Victory Junction serve live within boundaries. However, while at the camp, their only task is to conquer activities like the zipline or achieve first time experiences like a riding a horse, bowling, fishing or swimming. Obstacles based on their illness, disease or disability are no longer road blocks, they are merely speed bumps. When exposed to the limitless possibilities found at camp kids discover new ways to express themselves which builds a child's resilience with every new accomplishment and "first." At Victory Junction, kids are able to show off their "I can do it" attitude surrounded by encouragement and support. They meet other kids who are living with the same medical realities. Along the way they make friends, build self-esteem and attain confidence that will shape how they view the rest of their lives. 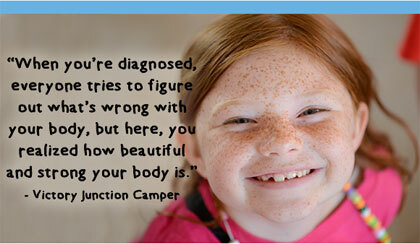 You can help Victory Junction provide that opportunity for every child facing a medical struggle or challenge. You still have time to give back and make your tax-deductible gift to Victory Junction before December 31. You can become a Dream Maker by helping send a child to camp so they can realize their differences are what make them strong! Seven-time IMSA Champions and six-time and defending Rolex 24 At Daytona Winners Ford Chip Ganassi Racing (FCGR) announced today that they will field two Prototype (P) class entries at the Rolex 24 At Daytona in 2016. The addition of the No. 01 and No. 02 Ford EcoBoost Prototypes brings the FCGR car count to a team-record four entries for the race after previously announcing a pair of Ford GTs last month. Partnership details and car liveries for the two Prototype entries will be announced at a later date. Chip Ganassi Racing Teams’ (CGRT) four-time and reigning Verizon IndyCar Series Champion Scott Dixon joins teammates Tony Kanaan (2004 Champion and 2013 Indianapolis 500 Winner), Kyle Larson (NASCAR Sprint Cup Series 2014 Rookie of the Year) and Jamie McMurray (NASCAR Sprint Cup Series 2010 Daytona 500 and Brickyard 400 Winner) in the No. 02 car to defend their 2015 win, while FCGR newcomer and FIA European Formula 3 Championship race winner Lance Stroll will join former Formula One driver Alex Wurz, reigning WEC (World Endurance Championship) LMP1 Champion Brendon Hartley and three-time FIA World Touring Car Champion Andy Priaulx in the No. 01 machine. The 2016 FCGR Rolex 24 At Daytona driver roster is an impressive group of international racing Champions representing two Indianapolis 500 titles (Dixon-2008, Kanaan-2013), Daytona 500 and Brickyard 400 wins (McMurray-2010), five Verizon IndyCar Series Championships (Dixon-2003, 2008, 2013, 2015 and Kanaan-2004), five Rookie of the Year Winners in their respective series (Kanaan-1999, Dixon-2001, McMurray-2003, Larson-2014, Stroll-2008), and two wins at the 24 Hours of Le Mans (Wurz-1996, 2009). Rolex 24 Run: FCGR has the greatest stretch in Rolex 24 At Daytona history highlighted by six wins and two second-place finishes from 2006-2015. The team also has seven Championships (2004, 2006, 2008, 2010, 2011, 2012, and 2013) and 46 race wins to their credit since their introduction to sports car racing in 2004. 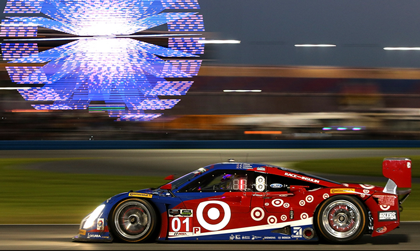 Chip Ganassi is the only team owner in history to win three-straight Rolex 24 At Daytona events (2006-2008). 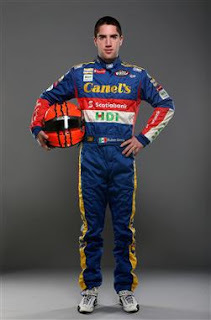 Scott Dixon: Dixon has been a permanent fixture at Chip Ganassi Racing Teams (CGRT) for 14 years and has been on the Rolex 24 At Daytona roster for FCGR since the team’s inception in 2004. The four-time Verizon IndyCar Series Champion (2003, 2008, 2013 and 2015) and 2008 Indianapolis 500 Winner was a part of the 2006 and 2015 Rolex 24 At Daytona-winning teams for FCGR. Dixon holds the distinction of being the winningest active Indy car driver with 38 victories, which ranks him fifth on the all-time win list. Tony Kanaan: The 2016 Rolex 24 At Daytona will mark Kanaan’s third race with FCGR after winning the 2015 Rolex 24 At Daytona in the No. 02 car, and also competing with the team in 2014. 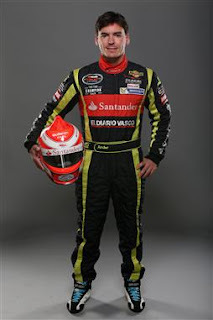 The 2013 Indianapolis 500 Winner, 2004 Verizon IndyCar Series Champion and 17-time racewinner joined CGRT in 2014. Kanaan is the all-time Indy car leader in consecutive starts with 249 consecutive starts dating back to the Portland race in 2001. In 2004, he became the first driver to complete every possible lap in a season en route to winning the championship. Kyle Larson: The 2014 NSCS Rookie of the Year will be racing for the third time in the Rolex 24 At Daytona after winning the event in 2015 alongside teammates Dixon, Kanaan, and McMurray. In his two-year career at CGRT, Larson has 75 NSCS starts in which he has earned one pole, 10 top-five and 27 top-10 finishes, while leading a total of 169 laps. Larson also has three career wins in the NASCAR XFINITY Series. Jamie McMurray: McMurray has competed in the Rolex 24 At Daytona seven times with FCGR (2005, 2010, 2011, 2012, 2013, 2014 and 2015) and had his best finish in 2015 with an overall win alongside teammates Dixon, Kanaan, and Larson. With his victory in the 2015 Rolex 24 At Daytona, McMurray joined the exclusive company of two other racing legends, Mario Andretti and AJ Foyt, as the only drivers to win both the Rolex 24 At Daytona and the Daytona 500. The 2003 NSCS Rookie of the Year has been a full-time fixture in NASCAR’s top division for 13 years with 474 career starts resulting in seven wins, 56 top-five finishes, and 131 top-10 finishes. McMurray is only one of three drivers to have won the Daytona 500 and the Brickyard 400 in a single season (2010). Lance Stroll: The 17-year-old Canadian entered his first kart race at the age of eight and claimed his first championship two years later. Stroll won the 2014 Italian Formula 4 Championship in his first year of single-seater racing and then the 2015 Toyota Racing Series before contesting the FIA Formula 3 European Championship last year. 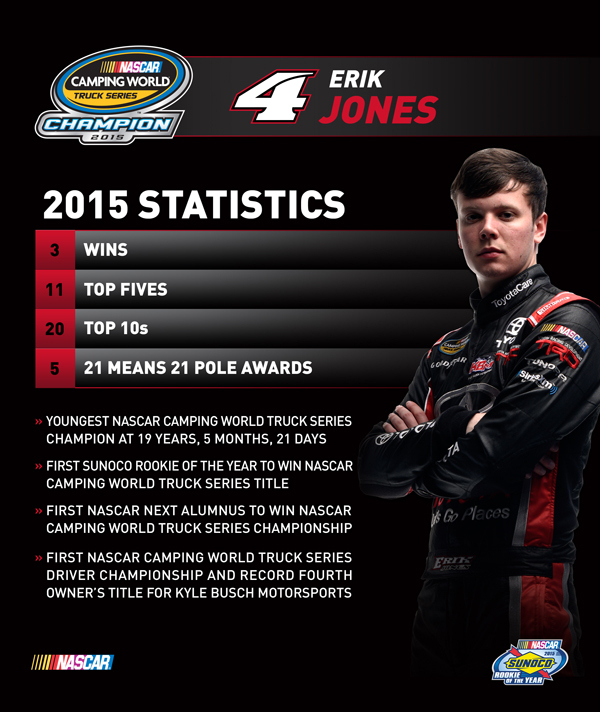 He recorded 17 top-six finishes, including one win, in 33 starts and will continue in the Series this year. Stroll, who also competed in the 2014 Florida Winter Tour, was selected in to the Ferrari Driver Academy in 2010 and last November was chosen by the Williams Martini Racing Formula One Grand Prix team to join its Young Driver Development Program. Alex Wurz: Retired Austrian Formula One driver Wurz started his driving career at the age of 15 in karts and worked his way up the ladder before making his debut in Formula One in 1997 with Benetton-Renault. Prior to his 11-year Formula One career, Wurz won the 24 Hours of Le Mans in 1996 and again in 2009. Wurz has also recorded wins at the 12 Hours of Sebring in 2010, Petit LeMans in 2011 and at the 6 Hours of Spa-Francorchamps in 2011. Most recently Wurz drove in the FIA World Endurance Championship from 2012-2015 for Toyota Racing and has recorded five wins in 28 starts. Brendon Hartley: Hartley began his racing career in karts at the age of six and quickly moved up the New Zealand racing ladder before moving to Europe in 2006 to enter the Formula Renault 2.0 NEC and Eurocup Formula Renault 2.0 series. Over the next two years, Hartley recorded 10 wins in various series throughout Europe before being asked to become a test driver for Formula One team Scuderia Toro Rosso in 2008. Hartley remained Scuderia Toro Rosso’s test driver as well as Formula One’s Red Bull Racing team’s reserve driver through 2010. He continued to compete in the Formula Renault 3.5 Series and the GP2 Series and was asked to be a test driver for Mercedes AMG Petronas F1 Team from 2012-2013. Hartley made his debut in the IMSA WeatherTech SportsCar Championship in 2013 in the P class recording one win before moving to the FIA World Endurance Championship for the 2014 and 2015 seasons. The New Zealander won four races in 2015 with Porsche Racing and captured the 2015 LMP1 championship title. Andy Priaulx: Priaulx is a British professional driver who started his racing career in karting at the age of eight and most recently served as a BMW Factory driver. Throughout his extensive racing career, Priaulx has claimed a European Touring Car Championship, three FIA World Touring Car Championships, and is the only FIA Touring Car Champion to win an international level championship for four consecutive years (2004-2007). Most recently, the British driver recorded wins at the Race of Champions in 2015 and the 12 Hours of Sebring in 2011. He has won over 50 races and drove as a factory driver, which included Formula 1 testing, DTM and Sports Car programs. NASCAR Race Mom really enjoyed the post quoted below by Jeff Davis. Davis is a former NASCAR driver from Anaheim, CA. 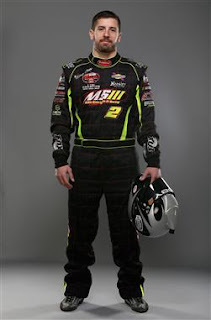 He competed in three Sprint Cup Series events in his career. 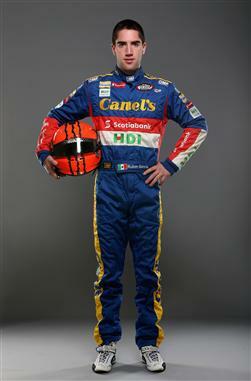 His first race was in 1992 at the Phoenix International Raceway, in his own equipment and produced his best finish. He started thirty-ninth in the field of forty-two and completed all but thirteen laps in route to a solid 26th place effort. 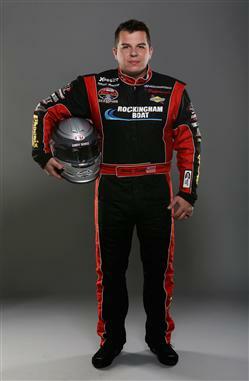 Davis also participated in the K&N Pro Series West from 1992 to 2005. In 1994, he finished fourth in the series point standings. I love this time of year since it brings up some good old memories. 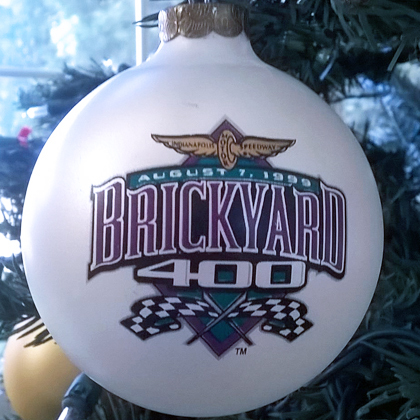 Luckily I thought to buy this Christmas tree ornament in 1999 which was the second time that I tried to qualify for the Brickyard 400 at Indianapolis. The first time was the inaugural in 1994 which was only a week after my first child Jake had been born. That '94 event was cool since they put us Winston West teams in Gasoline Alley interspaced between Winston Cup guys. They put us in points order between Cup teams that were also in points order. So since I was in 4th place in Winston West, I was garaged next to Mark Martin. The inaugural Brickyard 400 Jeff remembers was held on Saturday, August 6, 1994, at the Indianapolis Motor Speedway. The race marked the nineteenth race of the 1994 NASCAR Winston Cup Series season. It was first race held at the Indianapolis Motor Speedway besides the Indianapolis 500 since the Harvest Classic in 1916. The race featured the largest crowd in NASCAR history, and a then NASCAR record purse of $3.2 million. NASCAR Race Mom was able to celebrate in the winner's circle with Jeff Gordon in 2014. Jeff Gordon became the first five-time NASCAR winner at Indy, snatching the lead from Hendrick Motorsports teammate Kasey Kahne on a restart with 17 laps remaining and holding on for his second Sprint Cup victory this season and the 90th of his career . Make your own memories and don't miss the stars of the NASCAR Sprint Cup Series on Sunday, July 24th at the 23rd Running of the 2016 Crown Royal Presents the 'Your Hero's Name Here' 400 at the Brickyard! Consumers twenty-one (21) and older, please take a moment and visit CrownRoyalHeroes.com to nominate your own heroes for a chance to have the Brickyard 400 renamed in their honor. Nominations will be accepted through Feb. 28 and five finalists will be chosen with a chance to win naming rights to the 2016 Brickyard 400. The NASCAR Foundation is dedicated to helping children learn how to win, both inside and outside of the classroom, through a variety of educational opportunities. The NASCAR Foundation is a 501 (c) 3 non-profit organization that represents the generosity of the entire NASCAR community. “The Little Drummer Boy” is a popular Christmas song written in 1941. It was originally known as “Carol of the Drum” and is based on a traditional Czech carol. Although there isn’t any reference to a drummer boy in the Christmas story in Matthew 1–2 and Luke 2, the point of the carol goes straight to the heart of the meaning of worship. The carol describes how a boy is summoned by the Magi to the scene of Christ’s birth. This echoes the worship Jesus described when He told of the widow and her two coins: “ ‘Truly I tell you,’ he said, ‘this poor widow has put in more than all the others. All these people gave their gifts out of their wealth; but she out of her poverty put in all she had to live on’ ” (Luke 21:3-4). God is worthy of our all. All the drummer boy had was his drum and all the poor widow had were her two coins, but the God they worshiped was worthy of their all. He is worthy of our all as well, having given His all for us. One of my favorite daily devotional writers, Bill Crowder, wrote this and It struck home in my heart so big today. It really speaks to who I am. There are so many things I messed up in my past that only Christ can overcome and forgive. You add that past which I bring to the simple ministry lifestyle Kathy and I have chosen to live today in comparison to most people, and there is little we have to offer back to worship the Lord except the love and care we have for others through our YWAM ministry, our local church, and our NASCAR Racing Family. It's why we do what we do for all these years in YWAM, MRO / NASCAR, and our local church. We can only bring our best like the Little Drummer Boy and the poor widow did. But that is why we love Christmas so much. God is worthy of our all. So today if you are like Kathy and me remember that "your little is a lot when you give your all." Merry Christmas everyone! On race day, Bob Butcher and other MRO chaplains perform a short church service for drivers, their families, crew members and anybody else with a garage pass. He is Pastor/Chaplain at Beyond Checkered Flags Ministries (Self Employed), Pastor / Chaplain at NASCAR and Pastor / Chaplain at Motor Racing Outreach Association. 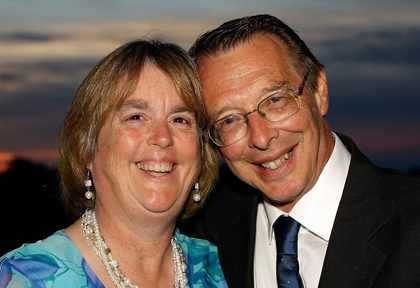 Bob and his wife Kathy have been married since 1980. Which is your favorite unique #NASCAR Sprint Cup Trophy? Martinsville's Grandfather Clock is high on NASCAR Race Mom's list. Coming in a really close second would have to be the Sonoma Wine Trophy. How about the Daytona Harley J. Earl Trophy? This trophy is presented to the winner of the premier – and season-opening event of the National Association for Stock Car Auto Racing (NASCAR), the Daytona 500. It is named after influential automobile designer Harley Earl, who served as the second commissioner of NASCAR. The trophy is kept on display at the Daytona International Speedway, while a small replica is given to each Daytona 500 winner. 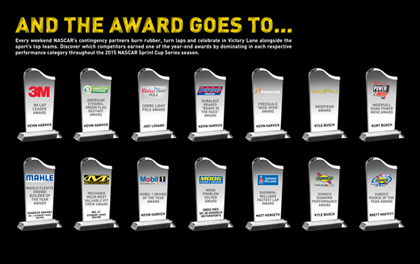 Which NASCAR Spring Cup Trophy is your favorite? John Krebs’ assigned chore is a huge plus for us #NASCAR buffs. You see, John was instructed to clean-out the old picture cabinet and found NASCAR history gold. John Krebs is a former NASCAR driver from Roseville, California. 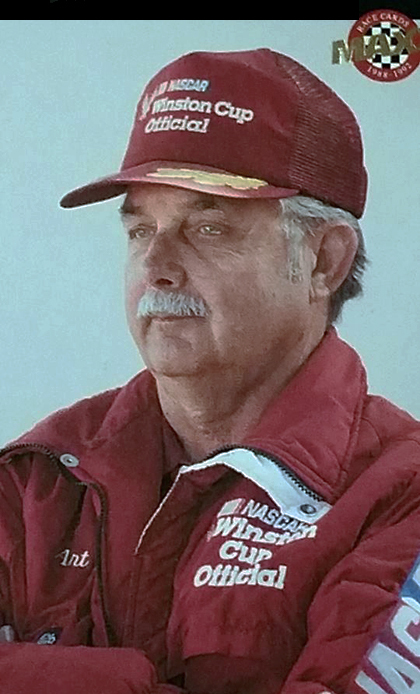 From 1978 to 1994, Krebs competed in nineteen Sprint Cup Series events; earning his best finish of nineteenth at the old Riverside International Raceway in 1982. 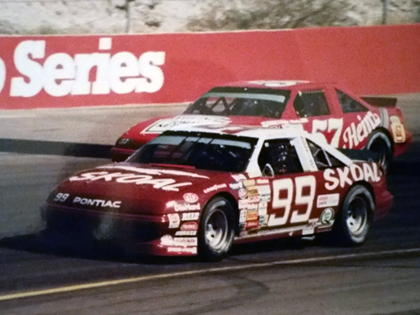 This racer also spent twenty years participating as a driver in the K&N Pro Series West (from 1977 to 2003). 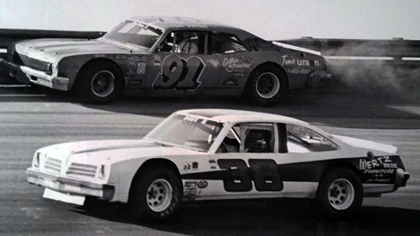 In August of 1978, when this series was known as NASCAR Winston West Series, Krebs won at Ascot Park, in Gardena, California with just a one second margin of victory. 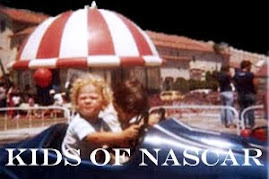 NASCAR Race Mom hopes that you enjoy John Krebs’ photos as much as she did. "What a bunch of long hair rednecks from Long Beach," Krebs captioned. John does not remember the name of the first man on the left, but did recall that he was a short timer who worked hard on the team. 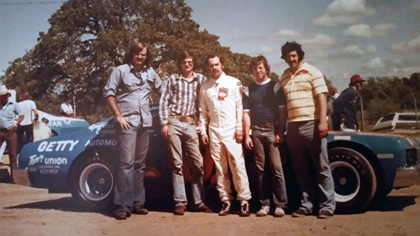 Next in line is Tom Murdock who races in the VARA Historical Series; then there is John in his white race suit; followed by Marty Lorge - John's long time friend; and lastly an even longer time friend, Frank Simonetti. "My Dad, Art Krebs, is eighty-eight years young." John commented. "Still machines all parts in shop. Old school machinist, better have measurements to the 100 thousandth. Worked for over twenty years with NASCAR Winston Cup both on West and East coast. 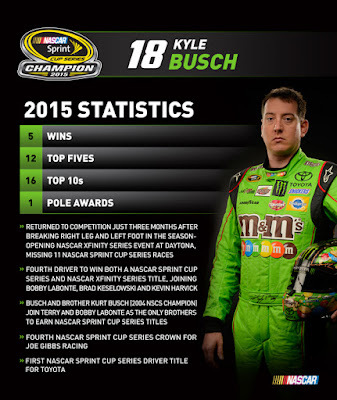 The stories he could tell about NASCAR - good and bad." Just a little to deep. John Krebs reported that he only hit it a little. Somewhere racing with Duke Hoenshell - Them there the days. Sponsorship on this car for the year consisted of a gas card from Jack Sellers and all the soda John Krebs could trade for things needed to race. This is Krebs' Ascot Park ride. "Ascot Park fun car to drive. I always unload fast, very low budget to operate." John reports. Krebs and Ronnie Esau at an unknown track. NASCAR Winston West Series racing with real manufacturers factory steel bodies. "Ascot Park. No front window, leather face mask, Open Face helmet and I had dirt everywhere." John Krebs reminisced. Krebs ran the whole year with corporate sponsorship from US Tobacco. A whopping contract that was for $50,000.00 a year. 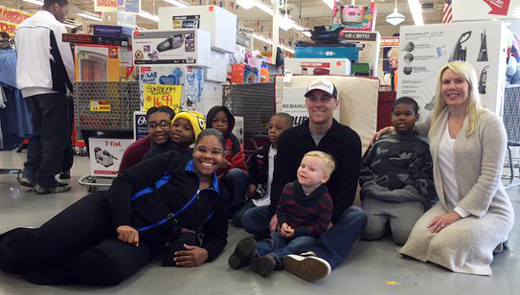 Four Charlotte area children recently displaced when their homes were destroyed by fire still had a Merry Christmas a few days early as guests of the Kevin Harvick Foundation for a shopping spree at Ollie’s Bargain Outlet on Monday. 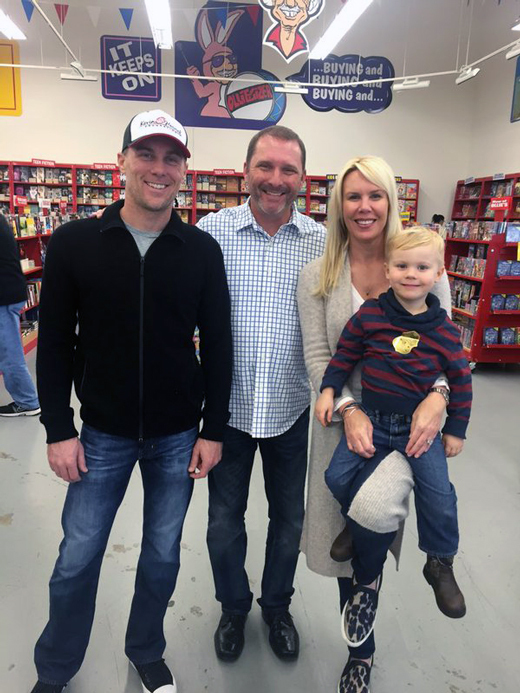 The four children, ranging in age from six to eleven and members of two families, were treated to a four-minute shopping spree at Ollie’s Bargain Outlet in Matthews, N.C. NASCAR Sprint Cup Series champion Kevin Harvick and his wife, DeLana, co-founders of the Kevin Harvick Foundation, partnered with Ollie’s for the holiday shopping blitz. Harvick drives the No. 4 Chevrolet for Stewart-Haas Racing in the NASCAR Sprint Cup Series. As a last-minute surprise, the Harvicks also treated the two mothers of the children to a shopping spree. The four children comprise two sets of siblings from two families – a boy, 9, and his sister, 11; and two brothers ages eight and six – were accompanied by their family members. When Blaze, the Charlotte Fire Department’s mascot, waved the green flag, the kids had four minutes to pack their shopping carts, steered by Kevin and DeLana Harvick and two firefighters, full of Christmas presents for themselves and family members. Some of the most popular items were: comforter sets for their bedrooms and their parents’ bedrooms; Nerf guns; LEGO Spider-Man; LEGO Dino Park; a tablet; Bluetooth headphones; a Frozen Olaf stuffed animal; vacuum cleaners; a crockpot; and a coffeemaker. In addition to the Harvicks, Ollie’s Bargain Outlet District Team Leader Mike Ciolfi and Capt. Sylvia Smith-Phifer, Charlotte Fire Department Chief, were on hand for the holiday fun and festivities. 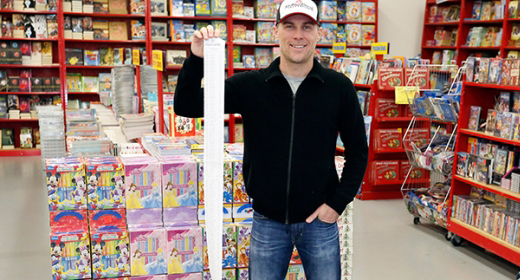 Ollie’s Bargain Outlet first partnered with Harvick in 2009 as a personal sponsor on his race car before joining the Kevin Harvick Foundation. 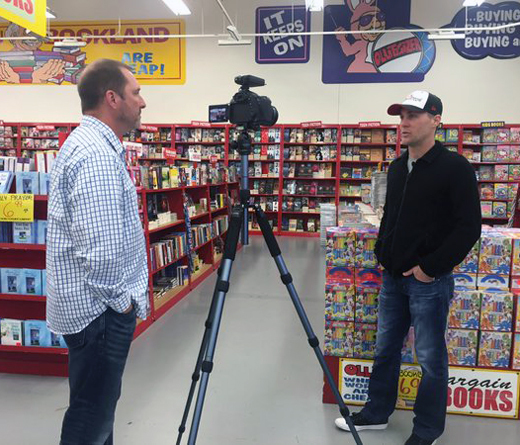 Established in 2010 by NASCAR Sprint Cup champion Kevin Harvick and his wife, DeLana, the mission of the Kevin Harvick Foundation (KHF) is to support programs that positively enrich the lives of children throughout the United States. The foundation works to not only improve the quality of life, but to help underprivileged youth find and realize their dreams. 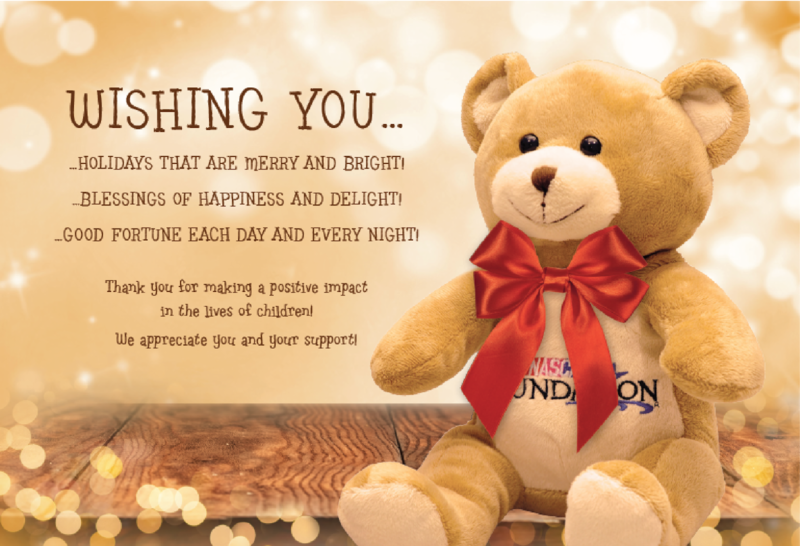 visit the KHF Facebook page at http://www.facebook.com/KevinHarvickFoundation. FOX Sports announces a NASCAR marathon, beginning Friday, Dec. 25 on FS1. NASCAR fans can start their 17-hour NASCAR marathon with three consecutive hours of "NASCAR Race Hub: Best Of The Year." Then viewers can relive everything from the benchmark 1979 Daytona 500 to the 1992 NASCAR All-Star Race to last season's dramatic Daytona 500, where Joey Logano scored the race win and 2015 NASCAR Sprint Cup Series champion Kyle Busch opened his memorable year on the sidelines after a devastating Speedweeks crash put him out of action for the first 11 weeks of the season. 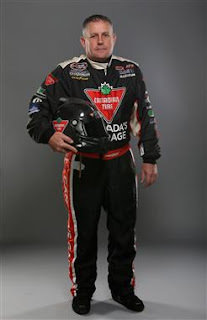 Scott Steckly, Champion of the Canadian Tire Services, poses for a portrait during the NWAAS Series Champions Media Day and Champions Portraits at GoPro Motorplex on December 10, 2015 in Mooresville, North Carolina. 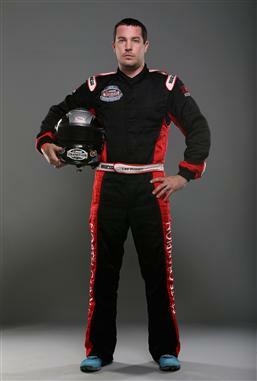 Chris Eggleston, Champion of the K&N Pro Series West, poses for a portrait during the NWAAS Series Champions Media Day and Champions Portraits at GoPro Motorplex on December 10, 2015 in Mooresville, North Carolina. Dale Earnhardt Jr. and Jeff Gordon didn’t just have the top two die-cast cars of the year, they dominated the list of best-selling cars which was unveiled today by Lionel Racing – The Official Die-Cast of NASCAR. Earnhardt’s new primary paint scheme drove sales of his No. 88 Nationwide Insurance die-cast to the top spot, while Gordon’s wildly popular throwback, the No. 24 Axalta Rainbow Chevrolet, was the company’s second biggest seller. The only driver to make the Lionel Racing list that wasn’t named Earnhardt or Gordon was Chase Elliott. Elliott’s No. 25 NAPA Chevrolet SS die-cast ranked a solid sixth. The 2015 Top 10 list is below. For more about this list, car images, and also the best-selling race win die-cast, special paint schemes, and overall driver performance, visit www.lioneltop10.com. Andy Seuss, Champion of the Whelen Southern Modified Tour, poses for a portrait during the NWAAS Series Champions Media Day and Champions Portraits at GoPro Motorplex on December 10, 2015 in Mooresville, North Carolina. Lee Pulliam, Champion of the Whelen All-American Series, poses for a portrait during the NWAAS Series Champions Media Day and Champions Portraits at GoPro Motorplex on December 10, 2015 in Mooresville, North Carolina. William Byron, Champion of the K&N Pro Series East, poses for a portrait during the NWAAS Series Champions Media Day and Champions Portraits at GoPro Motorplex on December 10, 2015 in Mooresville, North Carolina. Doug Coby, Champion of the Whelen Modified Tour, poses for a portrait during the NWAAS Series Champions Media Day and Champions Portraits at GoPro Motorplex on December 10, 2015 in Mooresville, North Carolina. Check out this opportunity to thrill your NASCAR fan this year. Treat yourself and others to the coolest holiday gift around! This is your opportunity to have your name and the names of other lucky folks you care about boldly placed on our NASCAR Foundation hauler that travels from track to track. The NASCAR Foundation is traveling across the country helping kids. They make classroom visits and deliver technology resources to schools nationwide that help turn our kids into winners. None of this is possible without the loyalty and generosity of you and our other NASCAR fans. In time for the holidays - A handsome certificate announcing the gift. After the first of the year - Twin framed photos of the hauler with names proudly displayed. Simply send your contribution of $100, $250 or even $500 for each name you want to appear on the newly wrapped hauler in 2016. What's more, this display will show your true commitment to helping turn our kids into winners. You will need to act right now to make sure they get your certificate into your hands (and the hands of the fortunate few you choose) in time for the holidays by visiting the foundation online at NASCARfoundation.org/hauler. 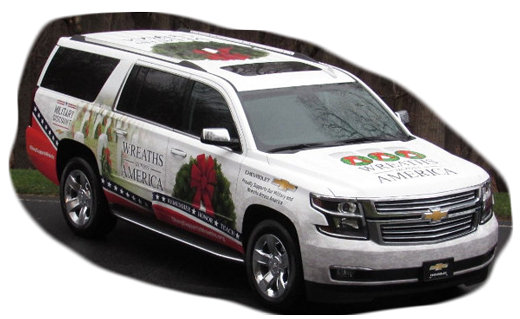 Help the NASCAR Foundation convoy keep on trucking - by giving yourself and others the gift that's sure to get their motors racing! Picture this: a remarkable young artist whose talent sprang from the challenges of a childhood fight against cancer is the 2015 winner of The NASCAR Foundation’s Betty Jane France Humanitarian Award presented by Nationwide. 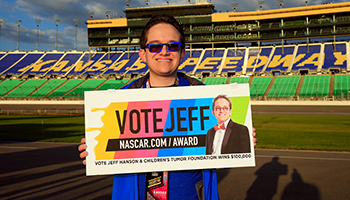 Jeff Hanson, 22, from Overland Park, Kansas, emerged from an elite group of four finalists after two months of online fan voting on NASCAR.com. The voting ended Thursday night; the fifth annual award was presented on Friday night during the NASCAR Sprint Cup Awards at Wynn Las Vegas. The Betty Jane France Humanitarian Award was established in honor of the foundation’s chairwoman emeritus and founder Betty Jane France, for her longstanding charitable and community service efforts. Since its inception, the award has benefited more than 52,000 children nationally. Hanson will receive a $100,000 donation from The NASCAR Foundation for the charity he represents, the New York-based Children’s Tumor Foundation, in addition to a 2016 vehicle from Official Car Sponsor, Ford. "Nationwide would like to congratulate Jeff for winning the 2015 Betty Jane France Humanitarian Award," said Terrance Williams, chief marketing officer for Nationwide. "Jeff’s impact has been an inspiration to us all and we look forward to seeing him continuing his amazing work." Hanson was only six years old when he was diagnosed with optic glioma, a tumor that was attacking his optic nerve. The tumor was caused by the rare genetic disorder neurofibromatosis (NF). 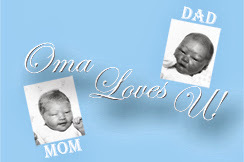 After undergoing chemotherapy and radiation treatments, he was legally blind at the age of 12. During chemotherapy treatments in 2005, Hanson began painting with bright colors suited for someone with limited vision. In 2006 he turned his paintings into a fundraising platform for the Children’s Tumor Foundation, selling them from his family’s driveway. He raised $15,000 that summer – and then, continued to paint. His paintings have now raised more than $250,000 for the Children’s Tumor Foundation and more than $1.3 million for charities worldwide. “What this means to me ... is I’m thrilled, I’m honored,” Hanson said. “It means so much to me, that I can help the Children’s Tumor Foundation with a $100,000 donation. “Being recognized by such a well-known name as NASCAR is a win for the Children’s Tumor Foundation and for neurofibromatosis, helping to raise awareness of a disorder that affects one in every 3,000 people. The money that we receive from The NASCAR Foundation will be used to launch an exciting new research program aimed at improving the lives of people like me who live with NF and help us get a little closer to finding a cure." This year’s award finalists also included Charlotte, North Carolina’s Bob Bowler of Special Olympics North Carolina; Sellersburg, Indiana’s Stephanie Decker of the Stephanie Decker Foundation; and Dunedin Florida’s Carl Flatley of the Sepsis Alliance. 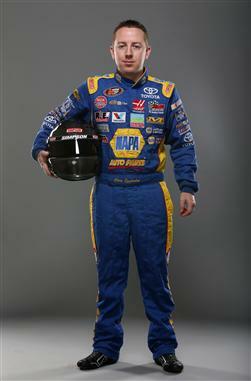 All three will receive $25,000 donations from The NASCAR Foundation for their respective causes. Since the days of racing on the beach in Daytona to present day NASCAR sanctioned races, Contingency sponsors have turned lap after lap and visited Victory Lane every weekend alongside the best teams in NASCAR. 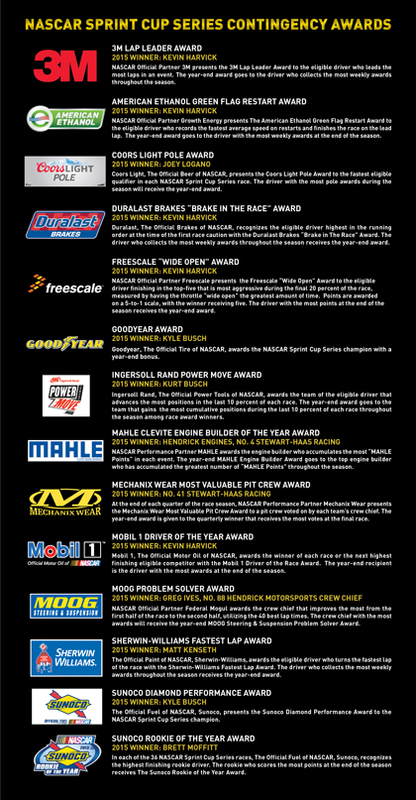 Each year, NASCAR Contingency sponsors contribute millions in prize money to NASCAR teams. In turn, many Contingency sponsors develop working relationships with teams and reap benefits of extensive exposure from fans at the track, in the garage and a captivated television audience. NASCAR Contingency sponsors get direct access to teams, connection with a loyal, passionate fan base and prominent visibility in our sport. The NASCAR Contingency Program strives to maintain strong relationships with high-quality, performance-driven brands that are leaders in their respective categories and drive money to all NASCAR teams via per-race and year-end postings. NASCAR handles all at-track administration of the Contingency Program and also processes all competitor payouts for each event. Entry blanks for all points-based events list Contingency sponsors and describe each award in detail, breaking down the distribution of posted Contingency money available to NASCAR teams. 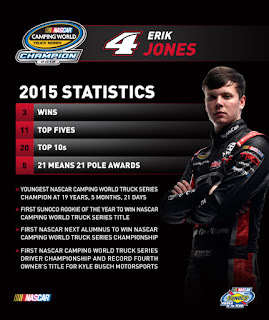 Competitors become eligible for awards money by displaying program decals on the front fenders of their race cars and race trucks and in some instances, use of a sponsor product is also an eligibility requirement. If a competitor does not run a specific decal, the prize money “rolls down” to the next eligible competitor, guaranteeing 100% payout for all posted prize money. Sometime too much of a good thing is bad. 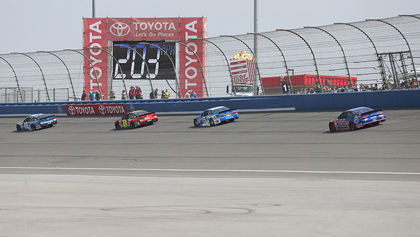 Be Ready When NASCAR Returns To The West Coast In 2016. There are only three tracks in the West to host the upper NASCAR series this coming year. Unfortunately for this westerner, the first three NASCAR races located in the vicinity which I can attend all happen in one month – March 2016. While NASCAR Race Mom understands that while this is logistically beneficial to the NASCAR team, it renders this fan unable to attend all three events. The cost of three races in one month is just too big of a hurtle. 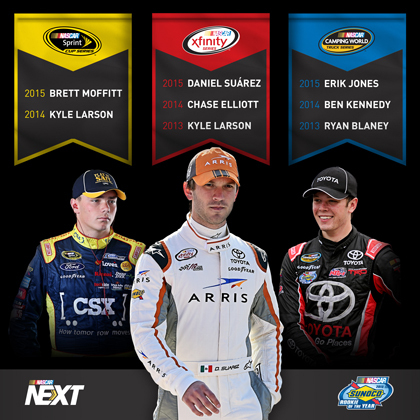 Purchase your tickets to see all of your favorite drivers in fabulous Las Vegas for the March 4 - 6, 2016 NASCAR Weekend. Fans can also experience the one-of-a-kind Neon Garage featuring live music and entertainment all weekend long. Driver introduction and Lucky 7 preferred parking passes also are available. The event weekend includes the Kobalt 400 NASCAR Sprint Cup Series race, the Boyd Gaming 300 NASCAR Xfinity Series race and Stratosphere Pole Day. The Good Sam 500 NASCAR Sprint Cup Series race weekend will take place March 11-13, 2015, starting off with Gatorade Pole Qualifying for the Good Sam 500 on Friday, March 11. Saturday, March 12 will feature the Axalta Faster. Tougher. Brighter. 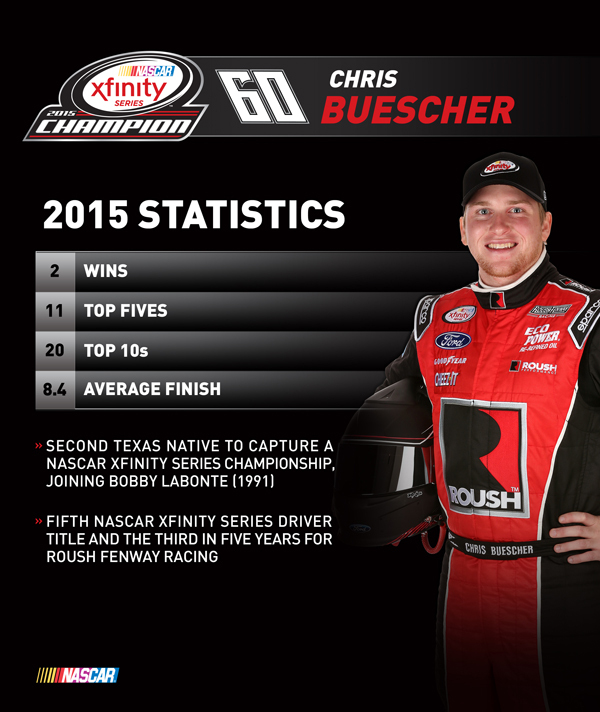 200 NASCAR XFINITY Series race; and the Good Sam 500 will take the green flag on Sunday, March 13. Located in Fontana, California this two mile paved race track always provides racing excitement. Fans also have the opportunity to take garage tours. In recognition of its “throwback” Southern 500 weekend, Darlington Raceway* was named the recipient of the 2015 Myers Brothers Award. 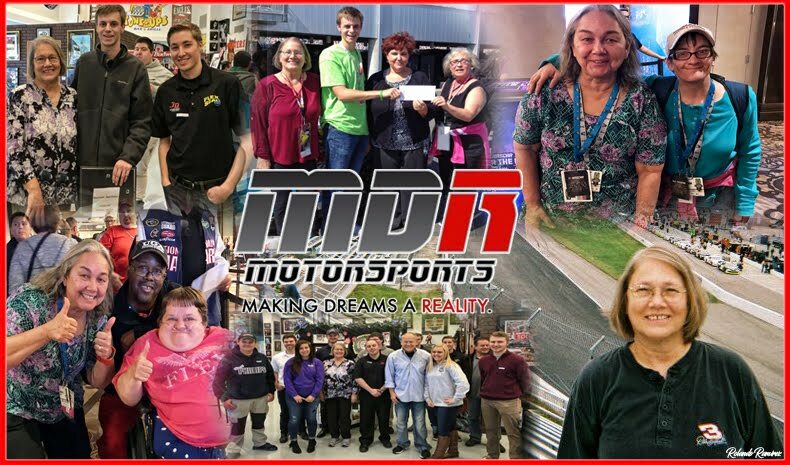 Voted upon by the National Motorsports Press Association, it is an esteemed accolade recognizing those who have made outstanding contributions to stock car racing. The track “Too Tough Too Tame” led an industry-wide tribute to the sport’s roots that coincided with NASCAR’s return to Darlington on its traditional Labor Day weekend date for the first time since 2003. 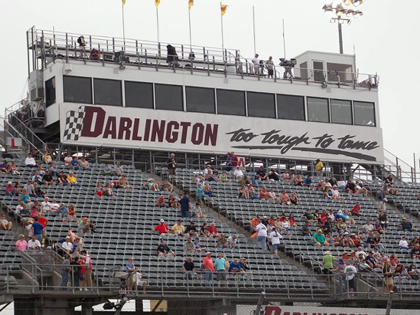 The annual event first took place when Darlington founder Harold Brasington opened NASCAR’s original concrete oval in 1950 and 25,000 spectators flocked to the egg-shaped South Carolina track. Teams emblazoned retro paints schemes on their cars, while drivers and crew members grew moustaches in homage to greats like Earnhardt and Petty. NBC even brought its old broadcast booth – consisting of Ned Jarrett, Dale Jarrett and Ken Squier – back together to call part of the race. 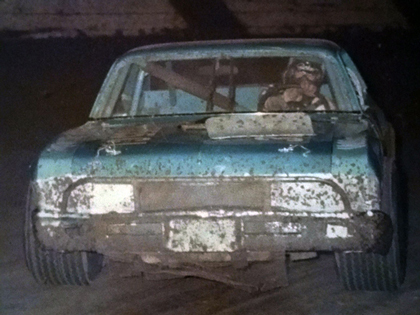 The best of the past and present were meshed together, providing long-time fans with nostalgia of their earliest NASCAR memories and giving new stock car racing enthusiasts an appreciation of the sport’s rich history. The Myers Brothers Award – named after pioneer NASCAR competitors Billy and Bobby Myers – has been presented every year since 1958. Twenty other awards were given out at the luncheon, acknowledging achievements ranging from marketing excellence to success on the track and skill in the garage. Champion Sponsor Award: Mars, Inc.
*Darlington Raceway is a race track built for NASCAR racing located near Darlington, South Carolina. It is nicknamed "The Lady in Black" and "The Track Too Tough to Tame" by many NASCAR fans and drivers and advertised as "A NASCAR Tradition." NASCAR announced today that Scott Miller has joined the organization as Senior Vice President of Competition, responsible for managing all competition efforts related to technology, inspection, rule development and officiating across NASCAR's wide portfolio of racing. Miller will report directly to Executive Vice President and Chief Racing Development Officer Steve O'Donnell, and work closely with Senior Vice President of Innovation and Racing Development Gene Stefanyshyn. All three are based at NASCAR's Research & Development Center in Concord, N.C.
Miller most recently served as Executive Vice President of Competition at Michael Waltrip Racing (MWR). There he was responsible for managing all areas of competition. During his four-year tenure, MWR teams qualified for the Chase for the Sprint Cup in 2012, 2013, and 2015. "We're pleased to have Scott, an executive with a wide range of racing experience, join our team," O'Donnell said. 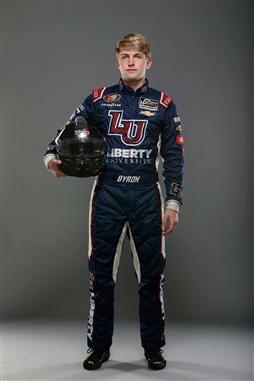 "He will be an immediate asset to NASCAR, our teams and each of our national series. Scott has worked in a collaborative spirit throughout his career, and represents the forward-looking approach we celebrate within our competition team." 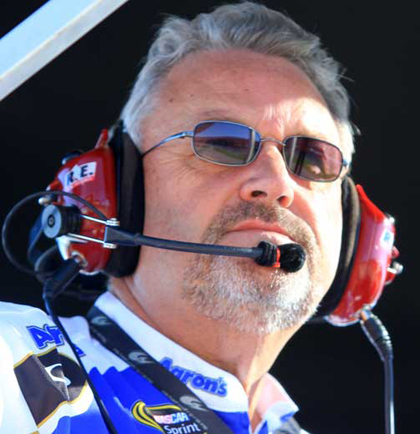 A respected leader within the garage area, Miller has more than two decades of NASCAR experience. Prior to his stint at MWR, he served in competition leadership roles at Richard Childress Racing. There he also helped lead teams into The Chase as both a crew chief and while serving as the Vice President of Competition. As a crew chief, Miller enjoyed his most successful season in 2008 when he called veteran Jeff Burton to two wins, seven top-five and 18 top-10 finishes en route to a sixth-place championship points finish. 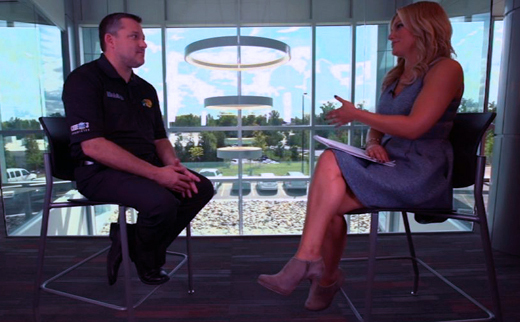 In all, the Bardstown, Ky., native has six NASCAR Sprint Cup Series wins as a crew chief. "I'm looking forward to using the experience I've gained working within teams in an entirely new way at NASCAR," Miller said. "Our sport has evolved quickly over the last several seasons through advanced technology and its creative application in the garage area. We will strive to continue this forward momentum while assuring a level playing field and competitive racing. It's a challenging opportunity and a logical next step for me. I can't wait to get started." Prior to his focus on the mechanical side of motorsports, Miller got his start as a motorcycle racer, eventually advancing to the national level in AMA Motocross. He made the transition to race cars in 1981 and was competing in NASCAR shortly after. In 1983, he was an owner/driver in the NASCAR Winston West Series. He spent five seasons in IndyCar where he worked as a chief mechanic before joining Tri-Star Motorsports in 1995, competing weekly on the NASCAR Sprint Cup Series circuit.